Pierides, D. and Woodman, D. (2012). “Object-Oriented Sociology and Organizing in the Face of Emergency: Bruno Latour, Graham Harman and the Material Turn.” The British Journal of Sociology, 63 (4): 662-679. H/t Ecology without Nature. This paper explores the material turn in sociology and the tools it provides for understanding organizational problems highlighted by the Royal Commission into the 2009 ‘Black Saturday’ bushfires during which 173 people died in the Australian State of Victoria. Often inspired by Bruno Latour’s material-semiotic sociology of associations, organization scholars employing these tools focus on the messy details of organization otherwise overlooked by approaches assuming a macroscopic frame of analysis. In Latour’s approach no object is reducible to something else – such as nature, the social, or atoms – it is instead a stabilized set of relations. A Latourian approach allows us to highlight how the Royal Commission and macroscopic models of organizing do unwitting damage to their objects of inquiry by purifying the ‘natural’ from the ‘social’. Performative elements in their schemas are mistaken for descriptive ones. However, a long standing critique of this approach claims that it becomes its own form of reduction, to nothing but relations. Graham Harman, in his object-oriented philosophy develops this critique by showing that a ‘relationist’ metaphysics cannot properly accommodate the capacity of ‘objects’ to cause or mediate surprises. Through our case of the Victorian Bushfires Royal Commission, we argue that a purely relational model of objects loosens a productive tension between the structural and ephemeral that drives sociological analysis. By drawing on elements of Harman’s ontology of objects we argue that it is necessary for material-semiotic sociology to retain a central place for the emergence of sociological objects. In collaboration with CRESC and the Journal of Cultural Economy, the site acts as a resource hub and network for researchers interested in consumer markets. It features a range of material including news items, events and announcements, commentaries and working papers as well as photo essays and data visualisations. At the moment, this includes recent posts from Franck Cochoy, Bill Maurer, Paul Langley, Linsey McGoey, Daniel Weinbren, and Liz McFall. Charisma takes a robustly interdisciplinary approach to consumer market research since we believe that properly understanding the mix of devices and desires that drive markets means being open to experimental, visual, digital, as well as more traditional techniques, methods, theories and perspectives. We invite interested researchers to participate and contribute to the site. Charisma is designed to allow the production of content amongst a diverse range of participants. Members of the research network will be issued with an account enabling them to upload content ranging from publication or conference announcements, photos, blog entries or research briefs. With this in mind, if you or your colleagues are interested in being part of this research network, please send a request to admin@charisma-network.net. Please feel free to distribute this email widely. Forthcoming events with Callon, Latour et al. 20 February 2012, 18:00 – 19:30 – Bruno Latour at the Science Gallery in Dublin. After a few decades of increased interest in non-human things, it seems like a good idea for the social sciences to now look again, with their renewed intellectual gaze, at the traditional objects of anthropology that are human beings. What has the detour via things helped us discover about men and women, about individual subjects, about persons? More specifically, the question may be to understand in what ways humans are affected, and possibly redefined, by the non-humans they cohabit with. This workshop proposes to explore this question by confronting the point of view of three social scientists, from three distinct disciplines: Franck Cochoy (University of Toulouse, Sociology), Alain Pottage (LSE, Law) and Peter Miller (LSE, Accounting). Each of them has already, in his personal works, explored the frontier between persons and things (Pottage), subjects and instruments (Miller), or dispositifs and dispositions (Cochoy). All three have, moreover, focused acutely on the sphere of economic transactions, where persons aspirations intermingle constantly with accounting, legal and marketing devices. Their dialogue — or experimental trialogue, rather! — should help us see more clearly how unexpectedly personal things can sometimes get. For further information on the workshop, please contact Martin Giraudeau, at m.l.giraudeau@lse.ac.uk. 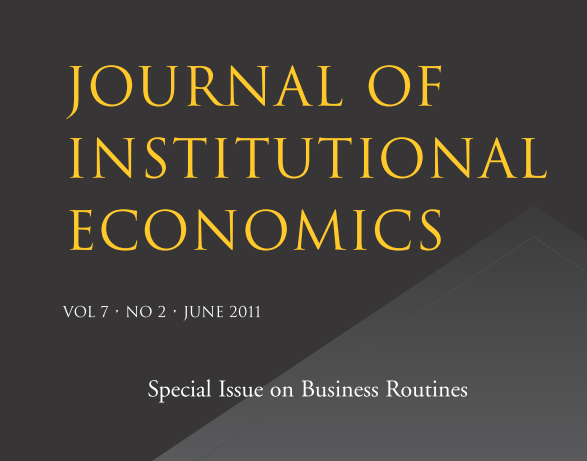 There is an interesting debate unfolding on the pages of the current issue of the Journal of Institutional Economics, a special issue on Business Routines (Vol. 7, issue 2). It appears to mark the moment when institutional economics and the economic theory of the firm first encountered actor-network theory and its allies (unless I’d missed that moment happen somewhere else already). The encounter was partly brought about by the confrontation between Teppo Felin & Nicolai Foss, who had launched a broadside against the literature of organizational routines, and Brian Pentland, who in turn rode to the rescue. Felin & Foss have been advocating for some time a “return to micro-foundations” in organisation studies (see e.g. Felin & Foss 2005), by which they seem to mean a return to methodological individualism, in the face of the methodological collectivism they perceive in the literature of organizational routines (which can be traced back to Schumpeter and includes the evolutionary theory of the firm and the resource-based theory it inspired, as well as the more recent efforts to develop a theory of organizational routines by Feldman, Pentland et al.). In short, empiricist and behaviorist approaches postulate a strong, deterministic relationship between various inputs and associated outputs. Various external factors (whether stimulus, experience, environment, exposure, situation) essentially determine not only outcomes but also the internal make-up of the organism in question. there is an opportunity to study the underlying ‘microfoundations’ of organization, that is to study the individuals that compose the organization, their underlying characteristics, nature, abilities, preferences, choices, and so forth. There are three interesting responses to Felin & Foss by Sidney Winter (who disputes the above characterisation of the routines literature as empiricist and behaviourist), Geoffrey Hodgson and Thorbjørn Knudsen, and Brian Pentland. Let’s focus on Pentland’s response, as it draws directly on the tradition to which ANT belongs, and Pentland himself deployed ANT in some of his earlier work (e.g. Feldman & Pentland 2005, Pentland & Feldman 2007). They have created philosophical problems concerning organizational routines by disconnecting words from their meaning in practice; they write about ‘experiences’ and ‘routines’ in general, rather than writing about any specific experience or routine. (…) By avoiding empirical examples, and by overlooking or misrepresenting current theory, they create the impression that there are serious problems and confusion in the literature on organizational routines. Multiple actors are involved. Dozens of people participated in processing invoices, but it is important to note that not all of the actors were human. Across the four organizations studied by Pentland et al. (2010), the percentage of actions taken by the humans ranged from 15 to 89%; the computerized workflow system performed the rest of the actions. Some recent theories of organizational routines have been grounded in theories of structuration (Giddens, 1984) and practice (Bourdieu, 1990). Routinization is at the core of structuration theory (Giddens, 1984). Likewise, Bourdieu’s (1990) concept of practice centers on the repetitive, patterned activities that constitute habitus. These theories use different vocabulary and emphasize different things, but they have made a fruitful foundation for a theory of organizational routines (e.g., Pentland and Rueter, 1994; Feldman, 2000, 2003; Feldman and Rafaeli, 2002; Feldman and Pentland, 2003; Pentland and Feldman, 2005). This theoretical view is successful because it is supported by detailed ethnographic observation of a wide range of actual work practices, such as filing papers in an office (Suchman, 1983), photocopier repair (Orr, 1996), medical imaging (Barley, 1986), technology roadmapping (Howard-Grenville, 2005), software support (Pentland and Rueter, 1994), navigating a ship by sight (Hutchins, 1991), and many others. The most serious flaw in the current Felin and Foss paper (2011), and in their so-called ‘microfoundations project’ in general, is that it fails to incorporate current thinking about the ontology of organizational routines. (…) Contemporary scholars have adopted the term ‘sociomateriality’ to refer to this phenomenon (Orlikowski, 2007; Leonardi and Barley, 2008). Building on the work of Latour (2005), Law (2004) and others, Orlikowski has argued that: “…every organizational practice is always bound with materiality. Materiality is not an incidental or intermittent aspect of organizational life; it is integral to it” [emphasis in original] (Orlikowski, 2007: 1436). Existing theories of organizational routines have generally had simplistic and extreme views of artifacts as fully deterministic or largely inconsequential. Artifacts have been treated as either too solid to be avoided, or too flexible to have an effect. This paper endeavours to improve our understanding of the influence of artifacts on routines dynamics by proposing a novel and deeper conceptualization of their mutual relationship. In drawing from recent advances in Routines and STS/Performativity Theory, the paper contributes to advancing our understanding of routines dynamics by bringing artifacts and materiality from the periphery to the very centre of routines and Routines Theory. So there you have it: ANT and institutional economics face-to-face. Let’s hope that this debate results in some cross-fertilisation, although Foss’ initial response (“unfortunately Pentland has thoroughly misunderstood the nature of the micro-foundations projects we advocate”) suggests otherwise. However, Pentland and D’Adderio have provided plenty of pointers for where the theory of the firm could benefit from the insights of ethnographic studies inspired by ANT and related approaches. These approaches in fact share Felin & Foss’ desire to open up the black box of organisational routines: however, rummaging in the black box has already begun and it had found more than just ‘rational human actors’. Stable social arrangements are both individual and collective. They are necessarily possessed of a double nature. Sometimes it is useful to talk of individual entities: to imagine that they are discrete objects in an environment. But it is equally appropriate to treat them as collective effects – as patterned networks. The argument, then, is that the division between the individual and the collective is an effect. The distinction between individual and society is unnecessary. Indeed, it is seriously misleading. For the sociology of science and technology shows that the idea that society is a set of relationships between human actors is a misunderstanding. Instead it suggests that it is better understood as a collective association of human and non-human entities. Abell, P., Felin, T., et al. (2008). “Building Micro-Foundations for the Routines, Capabilities, and Performance Links.” Managerial and Decision Economics, 29 (6): 489-502. Callon, M. and Law, J. (1997). “After the Individual in Society: Lessons on Collectivity from Science, Technology and Society.” Canadian Journal of Sociology / Cahiers canadiens de sociologie, 22 (2): 165-182. Felin, T. and Foss, N. J. (2005). “Strategic Organization: A Field in Search of Micro-Foundations.” Strategic Organization, 3 (4): 441-455. Feldman, M. and Pentland, B. (2005). Organizational Routines and the Macro-Actor. Actor-Network Theory and Organizing. Czarniawska, B. and Hernes, T. Malmö: Liber; Copenhagen: Copenhagen Business School Press: 91-111. Latour, B. (2005). Reassembling the Social: An Introduction to Actor-Network-Theory. Oxford; New York: Oxford University Press. Nelson, R. R. and Winter, S. G. (1982). An Evolutionary Theory of Economic Change. Cambridge, Mass. : Belknap Press of Harvard University Press. Pentland, B. T. and Feldman, M. S. (2007). “Narrative Networks: Patterns of Technology and Organization.” Organization Science, 18 (5): 781-795. Submission deadline extended to 15 January 2011 for the 2nd EIASM Workshop on Imagining Business, focusing on “VISUALS & PERFORMATIVITY: RESEARCHING BEYOND TEXT,” to take place in Segovia, Spain, 19-20 May 2011. Following the success of the 1st Imagining Business Workshop in Oxford, 2008, this second event seeks to examine ideas and approaches which go beyond a focus upon text in order to explore the impact of images, pictures, signs, sounds and passions on the process of organizing. A process which also goes beyond traditional ideas of business and into many areas of our lives. By bringing together academics from a wide range of disciplines and approaches (e.g. organizational theory, accounting, anthropology, geography, art, sociology, communication studies, architecture, philosophy, social studies of technology, etc…), this event will provide an arena in which to discuss and debate different ways of imagining the complex process of organizing. The Organising Committee members are Paolo Quattrone – IE Business School, François-Régis Puyou – Audencia, Nantes School of Management and Chris Mclean – Manchester Business School. Call for papers: “How Matter Matters: Objects, Artifacts and Materiality in Organization Studies” – Third international symposium on process organization studies. 16-18 June, 2011, Corfu, Greece. Keynotes: Karen Barad, Wanda Orlikowski, Lucy Suchman. Download the full description here: CFP PROS 2011 (PDF). See this call for papers for EIASM’s 1st Interdisciplinary Market Studies Workshop to be held near Stockholm on 3-4 June 2010. The announcement gives a good summary of the recent surge of interest in the nature of markets and the contributions actor-network theory driven approaches and science and technology studies (STS) have made to this area in recent years. The workshop aims to be interdisciplinary and calls for contributions from all areas that have an interest in markets, such as business studies, marketing, STS, economic sociology, economics, economic geography, consumer research, cultural studies and anthropology. To apply, submit a 3-page abstract by 29 January 2010. The organising committee consists of Hans Kjellberg (Stockholm School of Economics), Debbie Harrison (Norwegian School of Management), Claes-Fredrik Helgesson (Linköping University), and Susi Geiger (University College Dublin). Guest speakers include Bernard Cova (Euromed Marseille), Barbara Czarniawska (Gothenburg School of Economics), and Steve Woolgar (Saïd Business School, Oxford). You are currently browsing the archives for the Organization studies category.